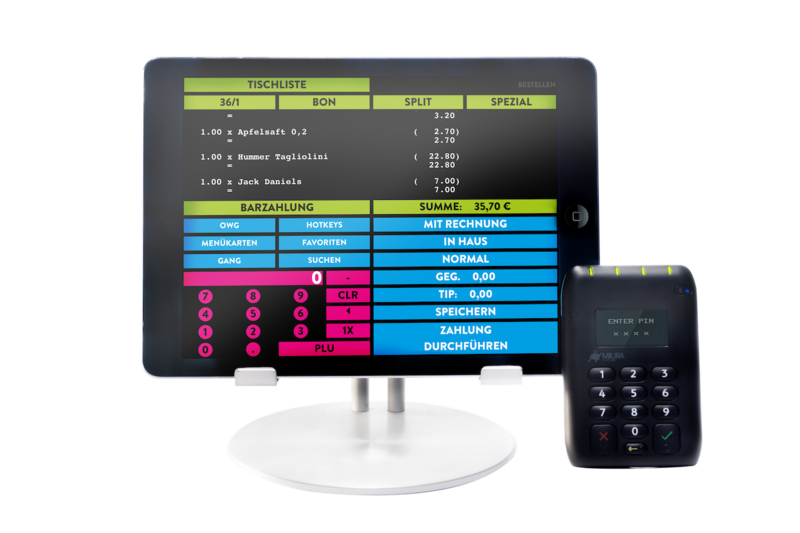 Whether it is a small restaurant, café, bar or a business with a seasonal, outdoor seating trade – more and more restaurant owners are opting for the tablet cash register system. It is no longer a surprise that mobile cash registers now offer so many features that they can easily match traditional cash registers. See for yourself below! Here are some of the features offered by our Matrix NEO! cash register app. NEO! can be used on a lot of devices. NEO! will run on the devices you already own, whether they are iOS or Android tablets or smartphones. This means that you can use the NEO! on the devices that you already have – so you save money and do not have to buy new hardware. NEO! can offer you the same features as a traditional cash register: There are hotkeys for the most frequently ordered items and you can, of course select cooking preferences and side orders. The cash register app can also record special requirements for guests and send these to the service staff in the kitchen. It is so easy for waiting staff to log onto the portable cash register using a transporter card to provide identification via NFC (“Near Field Communication” which enables contactless transmission of data). This means that the sales can be allocated to the relevant waiter or waitress, offering you, the restaurant owner, a good overview. Even authorizations and the setting up of profiles for waiting staff within the cash register app will help you. The Matrix NEO! will offer you a deeper insight into your turnover and the cost of sales because of its extensive back office reporting features and because the interfaces for inventory control, financial accounting and lots of other systems coordinate perfectly with the NEO! Using the Matrix NEO saves time spent walking to and fro because it is one of the few portable cash registers that can take EC card or credit card payments wherever your guests are sitting. In addition, the receipts can easily be printed off on the belt printer and the waiting staff can start serving the next guests right away. The layout of the receipt can, of course, be changed so that it always matches your corporate design. And besides that: the Matrix NEO! is much more energy efficient than other mobile cash registers because of the specially designed user interface – no more need to charge devices frequently and the Matrix NEO! can be used far more often.